The Badgers had a most successful and enjoyable visit to The Erdington Conservative Club on 27th September 2015 and turned their “Strangers In Town” status to “Friends In Town”. It was great to see some different faces in the audience, along with some familiar friends that have been regularly following us since our launch gig. Stay tuned for upcoming news!! Strangers In Town – The Badgers are visiting Birmingham! 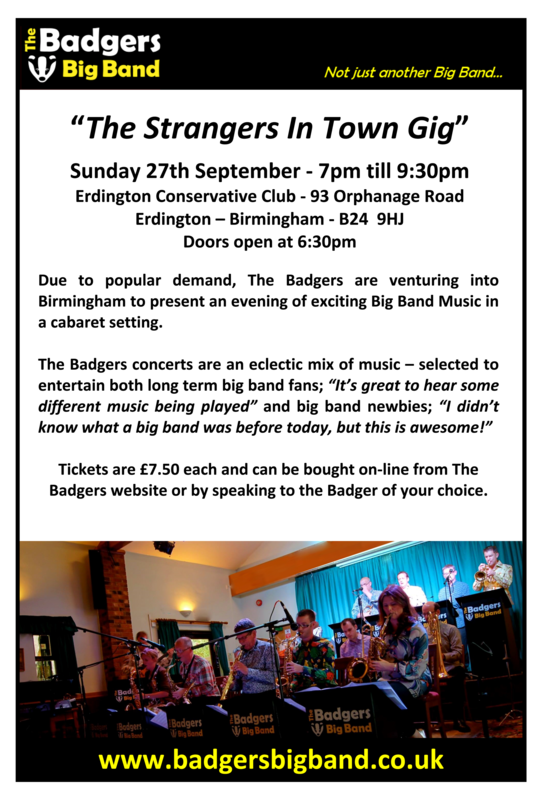 Due to popular demand from the more centrally located Badgers Big Band Buffs, The Badgers are venturing into Birmingham on Sunday 27th September to present an eclectic mix of big band music at the Erdington Conservative Club. Posted in Badger Updates	| Comments Off on Strangers In Town – The Badgers are visiting Birmingham! 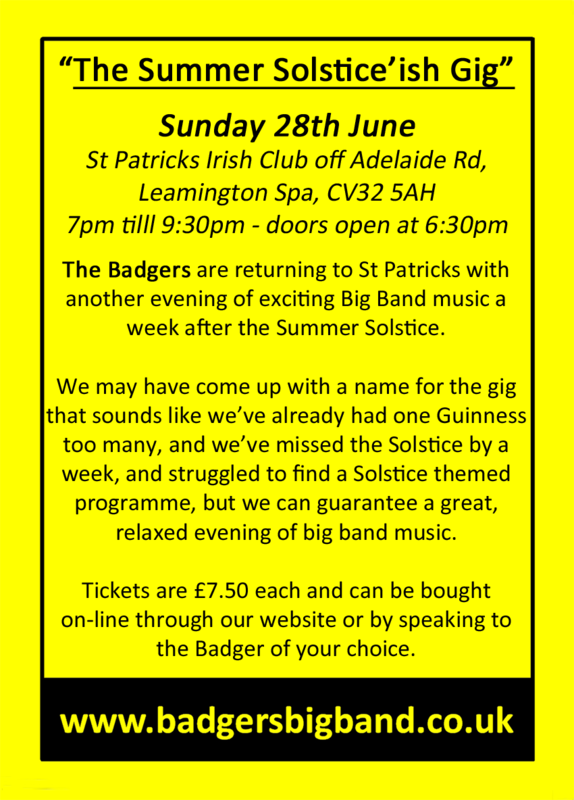 It’s short and sweet, but even Chris Evans is talking about our gig (14 minutes in) – The Badgers Big Band coming up this Sunday at St Patrick’s Irish Club, Adelaide Road, Leamington Spa CV32 5AH. Tickets are now available on the door. Starts at 7:00pm until 9:30pm. Chris kicks off coverage of the 2015 Glastonbury Festival with live music in the Tepee. Posted in Badger Updates	| Comments Off on Fame at Last!!! 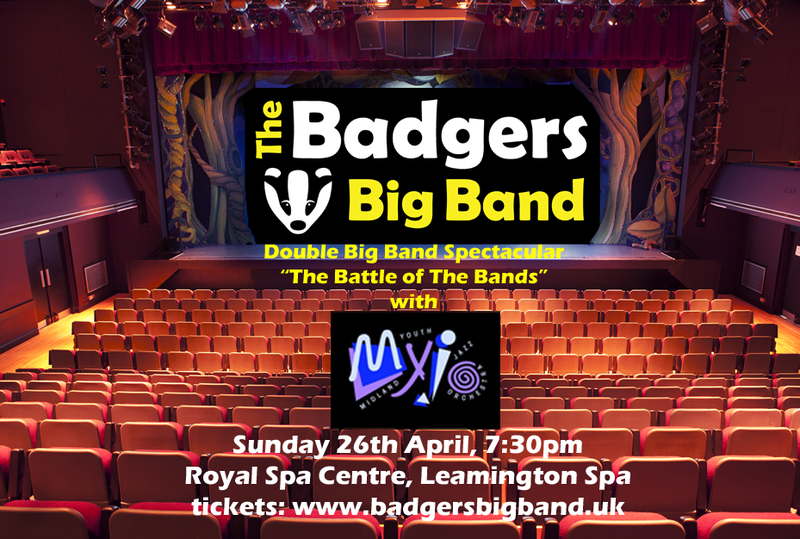 It was a MYJO/Badgertastic night at the Royal Spa Centre in Leamington on Sunday. Posted in Badger Updates	| Comments Off on What A Night!! Sunday 26th April 2015 – Save the date in your diaries for a “Battle of the Bands” Big Band Spectacular! 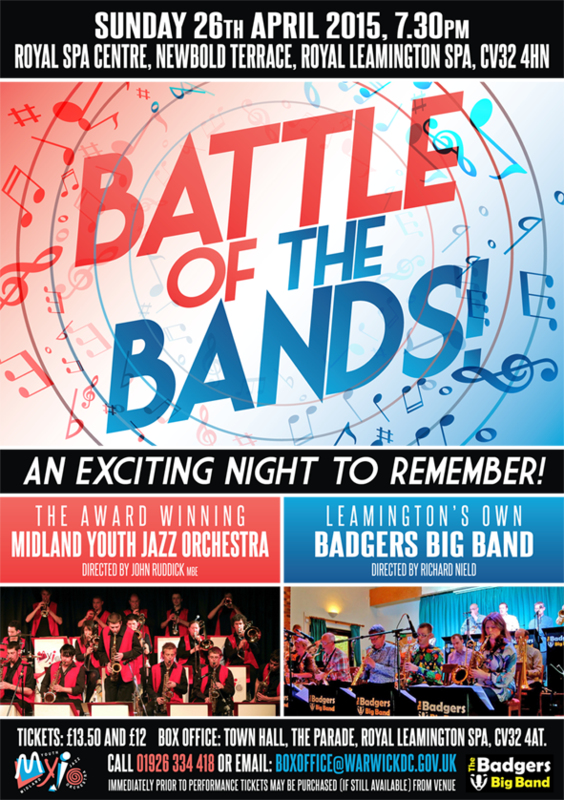 We are proud to announce that The Midlands Youth Jazz Orchestra and The Badgers Big Band are coming together for a brilliant evening of big band and swing music at The Spa Centre in Royal Leamington Spa. Tickets are available now from our Badgers Shop. We look forward to seeing you there. This is a night not to be missed – The Badgers Big Band and MYJO performing a joint concert. If you like great music performed at the highest level then this is the concert for you! 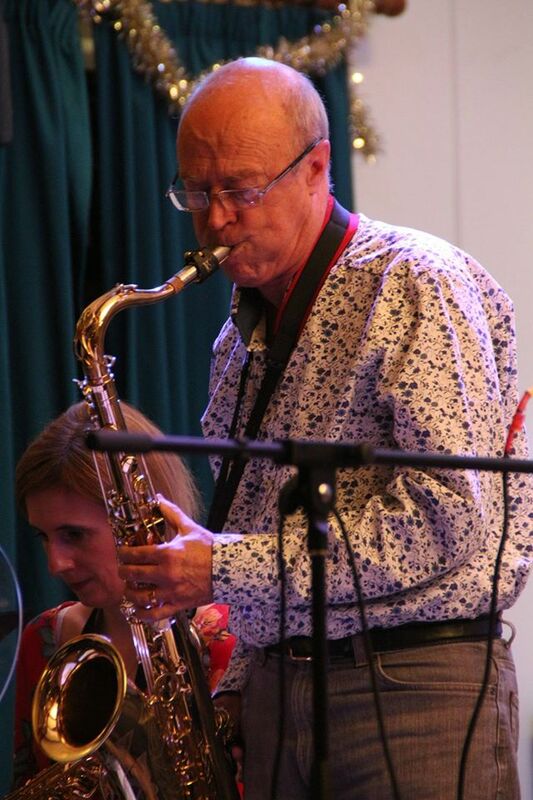 Welcome to 2015, and welcome to Bob Jones, who has taken up residence on the lead tenor sax chair. Bob has been playing with the Badgers on a temporary basis for some time now, but we are pleased to confirm that he has joined us on a permanent basis. You can find out more Bob and all of The Badger family on the “Meet The Badgers” page here. Roll up, roll up….. “The 80% Non-Festive Gig” Tickets now on sale! Tickets are now available on-line from the Badgers Shop for our gig on 28th December. The Badgers are returning to St Patrick’s Irish Club, Leamington Spa for another evening of exciting Big Band music in the middle of the Christmas/New Year holiday. Treat yourself and your friends to a night out away from turkey leftovers, discarded wrapping paper and endless Christmas television repeats. Wow, what a night we all had last night! The Badgers were certainly in fine fettle and blew the audience away. 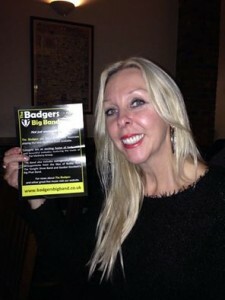 Well done to Sheila Waterfield, who won the Badgers Big Band Facebook competition. She won a lovely box of Badger Ale with her winning post on our Facebook page. We would like to thank our brilliant audience and the all the staff and committee at St Patrick’s Irish Club for all their support. We couldn’t do it without you.